Sambalpur: The 2nd Odisha River Conference organised on April 22 and 23 by Water Initiatives Odisha (WIO) and Mahanadi River Waterkeeper, along with about 25 partner organisations, concluded with a strong message asking governments to recognise the Rivers’ Right to Life in line with that enjoyed by Indian citizens, and help them flow freely in healthy conditions. The Conference also demanded that the governments help cater to the needs of riparian communities, maintain biodiversity and other priorities in a sustainable manner. 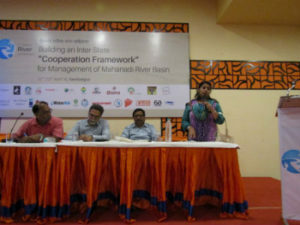 The Conference with the theme “Building an Inter-State “Cooperation Framework” for Management of Mahanadi River Basin”, which was held at Sambalpur, witnessed active participation by about 150 people including basin communities from both Odisha and Chhattisgarh, civil society representatives, academics, researchers, water experts, activists and others concerned from across the country. The participants raised concerns over the dying state of our rivers as well as the way conflicts between states are getting murkier. Looking into the way river basin disputes have been dealt with by the Tribunals under the existing law ‘Inter-State River Water Disputes Act 1956’ and the way states have responded to the Tribunal as well as Supreme Court decisions, the Conference felt that “Tribunals alone can’t save our ill-fated rivers and resolve the conflicts over them. Riparian states must keep the door to peaceful dialogues open and work jointly for rejuvenation of the river basins in ecological approaches with participation of communities and their institutions such as the Gram Sabhas.” This is also relevant for Mahanadi, felt the Conference, urging upon Odisha and Chhattisgarh to start a regular dialogue process led by Chief Ministers of both the states. The Conference welcomed the fact that Mahanadi dispute has already been referred to a Tribunal as because that is the only Constitutional mechanism available at the moment to resolve such disputes, and urged upon the Tribunal to order an immediate independent assessment of impacts all the dams and barrages are having on the water flow and ecology of the Mahanadi basin, and if needed, order removal of the structures that are found to have been illegally constructed or which are obstructing more water than the required volume of water that should be flowing downstream. Understanding the fact that the Tribunal will follow its own course of proceedings that may take time, the states should not waste any further time in initiating a dialogue process, the Conference felt. 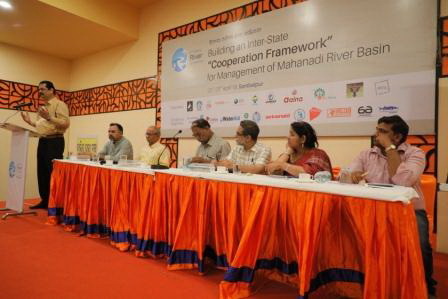 It was also decided that a civil society led process to bring together communities from both the states will be initiated by the Conference participants to help solve the water dispute and save the Mahanadi from further decay. The Conference, after long hours of discussions and debates in both general and technical sessions, decided to work on issues such as ensuring communities, including farmers and fisher folks their right to water from the basin; end water stress for women and children due to the depleting water resources; abate pollution of the river as well as other water bodies in the basin; build community capacity for disaster resilience due to climate change that is increasingly affecting the Mahanadi basin with increased frequency of droughts, floods, storms and sea rise; pursue with government to phase out coal-fired power plants and adopt a green energy path; and many more action and research initiatives. The Conference will be followed with meetings, capacity building workshops and other actions to pursue the agenda that has been unanimously adopted by the participants. The Conference has also resolved to push for a ‘Rivers Rights Act’ at the national level that will not only give our rivers the right to survive with similar rights enjoyed by human beings, but also recognise rights of the basin communities such as farmers, fisher folks, forest communities and indigenous communities over water on first priority and ensure the role of Gram Sabhas in decision making with regard to conservation of our Rivers.